Reconstitute the rice vermicelli according to package instructions. Dice the Sardines, shred the peppers and the onions to be cut it into thin strips. Beat the egg and fry them to obtain thin omelet. Then cut into strips. until the onion is fragrant. 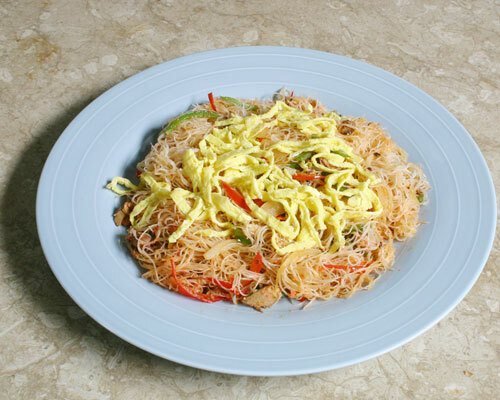 Add the rice vermicelli and the diced sardines, the crab roe and the seasonings. Just pour enough water to have a little sizzling at the bottom of the wok and mix well, until mostly dry. For the final touch, drizzle some sesame oil on top, then stir to mix well, and turn off the fire. Serve on platter and garnish with egg omelet. Comments: This protein rich recipe made with a wonderful combination of nutritious sardines & crunchy bell peppers is an ample source of B vitamins that are critical nutrients for all things mind-related: mood, memory, even migraines can benefit from the B's. In the right amounts, the B's can quell anxiety, lift depression, ease PMS, and boost your energy. One serve of this recipe also provides a whooping amount of calcium & Vitamin D which is essential to maximize the bone strength & to prevent the risk of osteoporosis. Almost half of the fats derived from the recipe are unsaturated fatty acids – Omega 3 which play a crucial role in protecting the heart from various diseases. These unsaturated fatty acids help to increase good cholesterol, lower high blood pressure, as well as prevent formation of blood clots, which has been often linked to heart attacks.